Cost containment opportunities relating to furniture may, at first, seem limited for military housing and lodging budget-holders; but let us consider the substantial investment in existing furniture. In a recent study, we found that the United States government owns or manages an estimated 900,000 buildings. Each of these buildings has a substantial inventory of furniture, and each of these pieces must be updated regularly to meet purpose, occupant comfort and satisfaction. 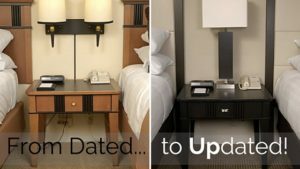 Case in point, in 2013, we completed two Army lodging projects for Intercontinental Hotel Group, refurbishing 130 armoires for Transient Lodge, in Dugway, Utah and Staybridge in Fort Jackson, South Carolina. Based on the median cost of new armoires, these lodging facilities saved over 80% in project costs. We consistently see savings upwards of 80% on an individual project basis. On a larger scale, the estimated annual cost of furniture replacement within the federal government is $714 million. If, rather than replacing new, each of these assets were repurposed through furniture asset management, the estimated annual cost would be $214 million which results in an estimated $500 million of budget saved. Our services won the prestigious General Service Administration (GSA) 2000 Evergreen Award for innovative, environmentally friendly practices and were chosen, again by the GSA, to submit the process as a best practice for government edifices. Furniture asset management as a best practice ensures that existing investment is protected while delivering pieces that are high quality, aesthetically pleasing and in line with military standards. This benefits the individuals and communities using the facilities, budget holders, taxpayers, and the environment. When it comes to managing furniture assets across government bodies, facilities and constituents, it is imperative to keep a well-updated inventory and explore all cost, environmental, and time-efficient options when those assets are no longer in acceptable condition. Buying new is rarely the best answer. The process of refinishing, reupholstering and remanufacturing is efficient, as well as cost effective. Projects are completed on-site, resulting in little to no downtime for facilities. This eliminates the need for furniture delivery and removal, reducing logistical effort, time, and cost. Specialized production teams work quickly and effectively, so remodeled furniture is available within one business day. Each step in the procurement of new furniture comes at a cost to the environment, from the creation of a new asset through to shipping, installation, and disposal of ‘unwanted’ furniture assets. In fact, a recent study calculated a total of 125.32 tons of carbon dioxide is emitted in the process. With furniture asset management, this can be reduced by up to 124.08 tons; leaving cumulative project emissions at just 1.24 tons. (2) At The Refinishing Touch, all the finishes used are clean, non-toxic and non-flammable, allowing for clean, safe and green on-site furniture refinishing. In addition to being financially and fiscally responsible, repurposing existing furniture also adheres to various requirements set forth by the federal government; requirements that are constantly building momentum. According to the U.S. General Services Administration, as dictated by regulations in Executive Order 13242 and USC Title 40, government agencies and establishments are required to implement sustainable environmental practices across renewable energy initiatives, waste management programs, construction projects, and more. Other legislation, such as the Federal Acquisition Regulation (FAR) 23.204, requires agencies to purchase products and services dedicated to environmental preservation.